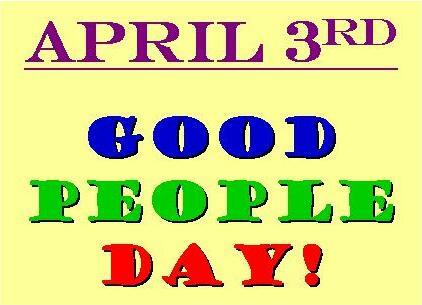 Via a post early today from CC Chapman and his communication from holiday founder Gary Vaynerchuk (who likes the vino) April 3rd is now Good People Day. Your mail will still be delivered and banks are open. I know a ton of awesome people but my especially my wife and children and basically anyone in my family. That’s a given. CC and Gary came up with the idea and/or communicated it to me so they are now also good people. The problem with a list like this is names will be omitted who should be highlighted. Know that if your not on this list but you are reading this blog I think YOU ARE GOOD PEOPLE. I’d have to write a book on each person to do justice to how great they are….I won’t cause I know my posts are too long anyway. Know that there’s a great story behind each name and probably a great story associated with you too. Thanks just being around and for being who you are. I’m grateful I have you in my life. Now please, post your list today. Do it, twitter it, podcast it. Today’s Good People Day. It’s an internet reminder to say thanks and that you’re important. Then just try and remember to do this everyday.